South Africa’s total surface area is 1,221,037 square kilometres. It’s the 24th-largest country in the world. It’s the ninth-biggest country in Africa, a region of 55 states. It’s the fifth-largest country lying entirely in the southern hemisphere. It’s bigger than every country in Europe apart from Russia, and every state in the USA except Alaska. It’s a dry country with no natural lakes, so the water area – dams and rivers – is only 4,620 square kilometres, just 0.38% of its total surface area. (India, by contrast, is almost 10% water.) That makes South Africa’s area of dry land some 1,214,470 square kilometres. Only six countries are the same size as South Africa, within 80,000 square kilometres. Chad, Niger, Angola and Mali – also in Africa – have a surface area equal to ours. In South America, Peru is slightly bigger than South Africa, and Colombia just a bit smaller. 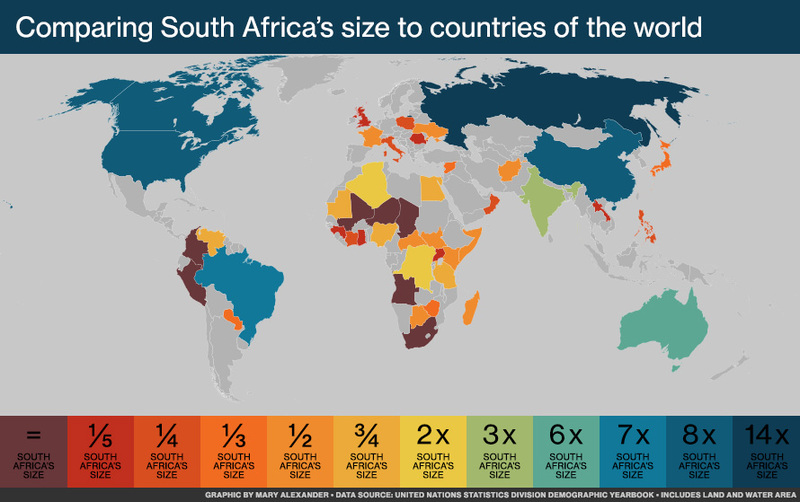 Well over 170 countries of the world are smaller than South Africa, but some are within a sensible fraction of our size. In Africa, Egypt and Nigeria are almost exactly three-quarters the size of South Africa (but have far larger populations). Ukraine and France are almost exactly half the size of South Africa. Iraq and Japan are a third. Poland and Italy are a quarter of the size. The United Kingdom and Romania are one-fifth the size of South Africa. And North Korea and Malawi are just a tenth of the size of South Africa. Only two countries are exactly twice the size of South Africa: Algeria and the Democratic Republic of the Congo, both in Africa. 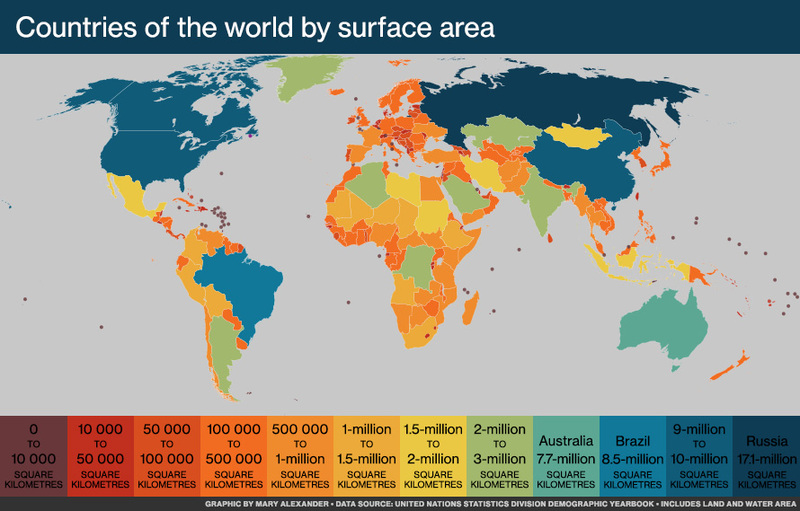 Elsewhere in the world, Australia is six times as big. North America’s USA and Canada are both eight times our size. We’re also dwarfed by our peers in the grouping of major developing economies known by the acronym Brics – Brazil, Russia, India, China and South Africa. India, the second-smallest nation in Brics, is three times South Africa’s size. Brazil in seven times bigger, and China – like the USA and Canada – eight times larger. And South Africa could fit into Russia – the world’s biggest country, by far – a full 14 times.